Working from home has so many benefits that make me forever grateful for what I do. I get to be my own boss, create a perfect schedule, and do what I love from the comfort of my home. There are also a few drawbacks to working at the same place you rest your head, like trying to stay focused. Right outside my little office, I have dishes that need to be cleaned, laundry that needs to be folded, and errands I have been putting off. These aren't the only things keeping me distracted either. With working from my computer and utilizing social media, I have a hard habit of turning the internet off when it is time to write. The internet gives me the world at my fingertips, and it can be too tempting to waste my time scrolling through Pinterest instead of getting my daily to-dos out of the way. While I still have my weak moments (especially when it comes to Netflix), I have found a few tricks that have helped me stay focused. 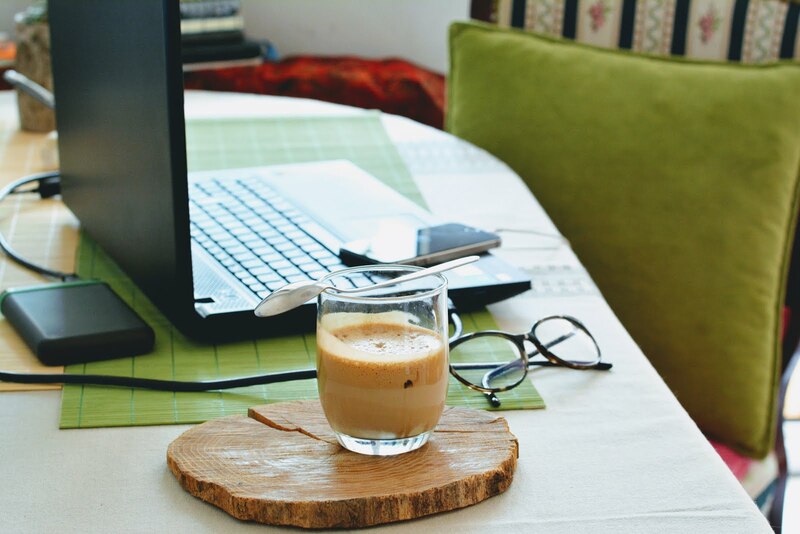 If you are working from home or at a desk, these tips might come in handy for you as well. I'm someone who can get bored quickly and, if inspiration is not happening, can find myself mindlessly wasting time. To a degree, we all have this phase hit us during work hours. While I still have my days that are not as productive as others, I have found these tips to steer me back in the right direction. My phone is usually my biggest distraction when I'm trying to focus. It will buzz silently in the background, and I'll feel the urge to check it, even if it is something pointless. I also find myself grabbing it when I'm bored or lacking inspiration. While technology is fantastic, it can be our biggest downfall during work hours. Putting your phone on 'do not disturb' will help you from continually reaching after you hear a notification bell. You can customize this feature so that certain people can still get ahold of you (I have my family on that list in case of an emergency) and then set it aside until you are done with whatever you are doing. One thing I have realized is that boredom is a fantastic thing that we should embrace. If you find yourself bored during work, don't grab your phone. This keeps our mind distracted and can keep our thoughts unmotivated. I see myself getting most of my inspiration during those dull and boring times. Separate your workspace from home. If you work from home, then you already know this is a rule that is a necessity. Right now we are updating our house, so my workspace is mixed into my bedroom. Even if you have a small house with no workroom, you still need to make a little area just for you. With the construction work, I have a desk that keeps all of my things, and I try to make it as separate from other things as possible. When you work from home, you have the problem with knowing you have other things that need to be done. You need to remind yourself that those things will be there when you are done and try to keep everything separated. It doesn't always work, but it is best for your mentality during work hours. I started this trick recently, and it has changed my life around. Before this trick, I was finding myself staring dejectedly at my computer, getting groggy, and only getting half of my goals accomplished for the day. It was like the more I tried to work the less I achieved. Now, I use a 20-minute rule to help me through this. For 20 minutes (or however much time you want) I spend my entire energy focusing on a specific work task. After that time is up, I'll take a small break. The break can be just a few minutes, but I do something away from my computer and phone. Staring at those screens for prolonged periods and sitting can tire your body, both mentally and physically. I usually use that break time to stretch, sit outside and get some fresh air, or even go to my local coffee shop and grab a drink. Even if you just walk around the house a couple times, these interval times will save you. There are so many apps out there now that can help us manage our time. For me, I use the app Forest to stay focused for increments at a time. This is a great app on your phone that keeps you from mindlessly scrolling. If you are having trouble leaving your phone alone (even after do not disturb) I highly encourage you to download this. How does this app work? Well, when you are ready to get to work, you just plant a tree on the app. You leave the app open and, the longer you stay off your phone, the bigger your tree will grow. If you end the app before your scheduled time, it will kill anything you started to grow. Over time, you will have a beautiful little forest created from all the focused energy. You can even use the points you earn to plant real trees, get statistics, and so much more. If you are having issues with your phone, I promise you will not regret downloading this. While most of us who work from home need our internet, we don't need it the entire time. For me, I write a lot of my articles offline before getting back on the web to do all the little odds and ends to it. During this period (if I'm finding myself scrolling the internet and becoming distracted), I'll turn off the internet in the house. You could just turn it off on your computer, but I have found that too easy to turn back on. Physically turning off the internet makes it a little more difficult just to switch it back on. Take that time to do whatever you can offline and, when that task is accomplished, you can use your wifi again. This might not work for every field, but it can be beneficial for anyone having issues with online shopping and other distractions. I used to think I was a multitasking pro. The problem is, none of us can actually multitask. Doing this creates more distractions and doesn't ever work out the way we want. I would look up pictures for my articles, write, and maintain social media and email all at once. Over time, I was noticing that my pieces were lackluster, my posts on media sites weren't getting much engagement, and I wasn't getting quality photos. When you try to juggle it all, everything loses its quality. A better way to tackle your goals is by focusing on them one at a time. I know it seems like this takes longer, but it actually saves you time. When you multitask, you have to spend more time to get that quality you like. Slow and steady always wins the race. Do something active on your breaks. This might go against what most articles say, but I use my breaks actively. I used to take them to chill out and scroll the internet, but I found that when I had to go back to work my heart wasn't all the way in it. Now, I use that time to do a house chore, walk around, meditate, or even get in an exercise. You want to use your break time to keep those brain juices flowing, not slow them down. I know it might seem beneficial to rest during this time, but you can do that when your work day is over. For one, most careers at home require us to sit for prolonged periods and stare at a computer screen. Like I said before, this can wear us out fast. You want to reenergize your body during break time by getting your heart pumping and keeping your mind engaged. Instead of watching a Netflix show, save that for later and do a lap around your block. It will get you pumped up and ready for the next task at hand. I hope these tips help you stay focused during your work days. While I still have my distracted moments, these tricks have decreased them immensely. 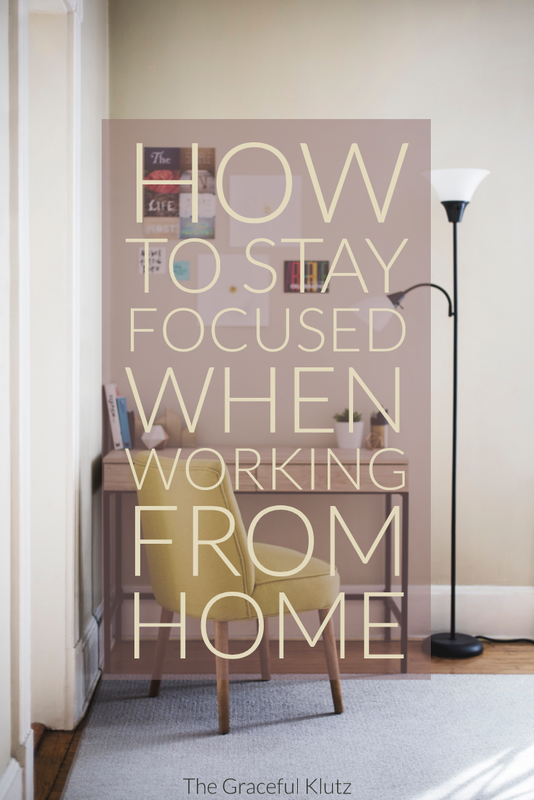 Share with me in the comments some things you do to stay focused and keep distractions at bay. Do you use any of these tips in your day to day life? Or, what apps have you found to be fantastic in the productivity department?